Rainbow Trout - The Sustainable Superfood. Guaranteed Boneless. Farm Raised. Recommended as Best Choice on the Monterey Bay Aquarium Seafood Watch Program. Delicate texture and mild flavor fish. Contains heart-healthy Omega-3s. Lean protein. Excellent source of Vitamin D.
Visit clearsprings.com or freshfishkitchen.com for recipes and serving suggestions. MRS. FRIDAY’S® PANKO BREADED COD FILLETS 3-4 OZ. MRS. FRIDAY’S® PANKO BREADED ALASKA POLLOCK 3-4 OZ. 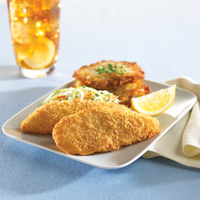 CASH & CARRY TAVERN BATTERED® COD FILLETS 2-3 OZ. KPCU TAVERN BATTERED® COD FILLETS 1-2 OZ.